Redfin are an iconic bread and butter species brilliant to target using both lures and soft plastics. Reddies are great to eat and they can be caught in big numbers, they are especially fun to catch when using light spinning gear. 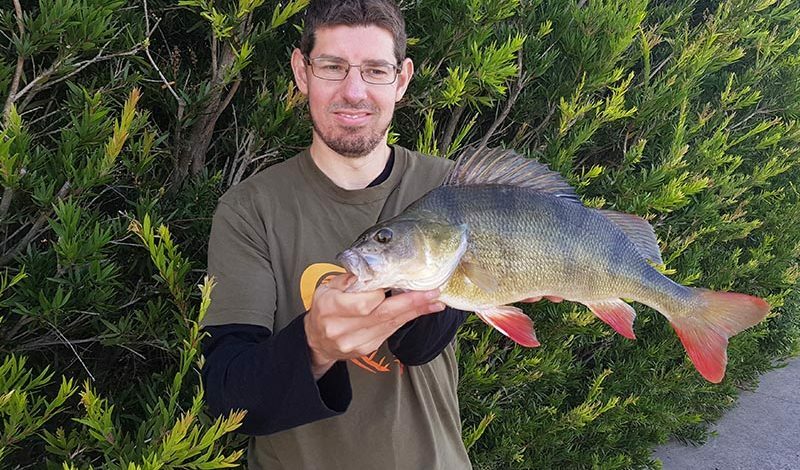 Redfin ( English Perch ) are very accessible species found in many rivers and lakes throughout Victoria. Click here to see our detailed guide of fishing locations around Melbourne & Victoria. By many anglers redfin are considered a noxious pest, infact its illegal to return them in some other states and water systems locally. However at FishingMad we simply love them and consider them a truly underrated fish species. Frequently we get asked “What are the best soft plastics or lures to use when targeting Redfin?”. Well, redfin are opportunistic feeders that will happily scoff many types of lures, metals and soft plastics. Redfin are aggressive cannibalistic species that will go at anything that imitates a Redfin or Trout. They will seem to like bright colours and lures that imitate baitfish. We can say with confidence that redfin will often take a lure on the bottom so allow time for your lure of plastic to sink. Try using bright colors such as red, green, pink, yellow & orange which have proven to be very successful. Redfin love structure so cast close to weed beds and tree branches. Here’s a detailed list of our favourite lures to get you started. Firstly when targeting redfin we recommend using an ultra light spinning outfit. This should consist of a fishing rod around 7 foot long. Typically 1-3 or 2-4 kilo capacity class. Coupled with a reel in 1000, 2000 or 2500 size. Spooled with a high quality braid and finished with a leader. Curl tail grub soft plastics are a great choice for redfin. These are most effective by keeping them close to the bottom with subtle lifts and pauses. I will generally cast these out, let it sink to the bottom and retrieve by applying small lifts and pauses every few meters. Redfin will often strike when you pause and plastics tail is fluttering down back to the surface. So pauses are very important. A few casts in one area then moving on trying to locate the schools. The beauty about these soft plastics is the action in the tail. So you can also cast and do a slow constant roll called a slow roll. This to will account for many redfin and prevent you from snagging up. Spoons have grown in immense popularity recently with the release of the Nories Wasaby and the Pontoon21 Paco. These spoons allow you to cover great distances as they cast a mile. These are great land based as you can get your lure into deeper water. Fishing these are quite simple cast out far then let it sink for a second or two then a constant medium pace retrieve. It’s a good idea to mix up the retrieval speed and add in the occasional lift and twitch. Paddle tails are another great option for Redfin and it’s the simple movement of the tail which gets the attention of the ever aggressive Redfin. These are generally fished by casting out letting the paddle tail hit the bottom. The retrieve is a simple slow roll with some twitches and pauses. I generally have the rod tip pointing down towards the ground and vary the retrieval speed. The beauty about these soft plastics is the action in the tail. So you can also cast and do a slow constant roll called a slow roll. This to will account for many redfin and prevent you from snagging up. Hard Body lures come in a huge variety of sizes, weights, colours and bib styles. Recently Redfin hard body lures have grown in popularity thanks to the Australian release Bullet Lures which cast a mile and are easy to use. There are many techniques to try when using hard body lures they can be as simple as casting out, keeping your rod tip down and retrieving with a slow roll or casting out and retrieving with a range of twitches lifts and pauses all controlled by your rod tip. You need to experiment and find what works for you. Blades can be a brilliant choice and are great to use at new locations as they allow you to cover big distances. You simply cast the Blade out as far as you can, let the Blade hit the bottom then simply retrieve with small lifts of the Blade than a small wind of your reel to gather the slack line. Then letting the Blade sink to the bottom again. Basically hopping the blade up and down of the bottom. This will imitate a wounded baitfish and quickly grab a Redfins attention. You need to pay attention as often Redfin will take the Blade on the drop. Spinners are a timeless classic for chasing Redfin. Cast them out as far as you can or near structure or into open water then letting the spinner sink until close to the bottom then simply retrieving. The retrieve speed can vary however a simple constant slow roll with some twitches works well. I generally have the rod tip pointing down towards the ground and vary the retrieval speed. Vibes are another terrific choice which can be fished in a similar fashion to a Blade. They too are a good lure to use at new locations providing there aren’t too many snags. They allow you to cover big distances and can fish very well for Redfin. You simply cast out as far as you can, let the Vibe hit the bottom then simply retrieve by lifting a small wind then letting the vibe sink to the bottom again. You need to pay attention as often Redfin will take the Blade on the drop. Timeless classics are just as effective now as they were back in there heyday. Although people are moving to plastics, hard-body, spoons, vibes and, Blades these old classics continue to work and produce solid Redfin. Minnow style soft plastics come in 2 distintive tyopes, natural bait immatations to mimic a bait fish or brightly coloured to stand out and get a reddies full attention. These work really well and you just need to mix up your retrieval techniques and rig them correctly by using an appropriate size jig head and putting them on straight to enhance the plastic action. You may also want to consider using a scent like s-Factor or Pro Cure for nonscented plastics to increase your chances. Bugs and crustaceans come in a vast variety of shapes, colours, and sizes and are growing in popularity. With realistic designs and through to brightly coloured designs with a lot of imagination. The reality is they all work. Just remember to mix up your retrieval techniques and rig them correctly by using an appropriate size jig head and putting them on straight to enhance the plastic action. You may also want to consider using a scent like s-Factor or Pro Cure for nonscented plastics to increase your chances. As you can see from the list above Redfin generally love bright colours. The colours I have always had success with include Red, Green, Pink, Yellow & Orange. They love anything that imitates a small Redfin or a natural baitfish. If you have any ideas or feedback please share them by sending them to reports@fishingmad.com.au or contacting us on our Facebook Page. Make sure you send us pics of your fishing adventures we would love to add them to this article or social media pages.